Pink seems to be in a really bad mood today… do we blame it on the pig? I didn’t know Janet had a licence to practice paper surgery. I don’t blame her for not including all her children in the photo. i’ve never seen the red kid before…is he/she neglected or something? 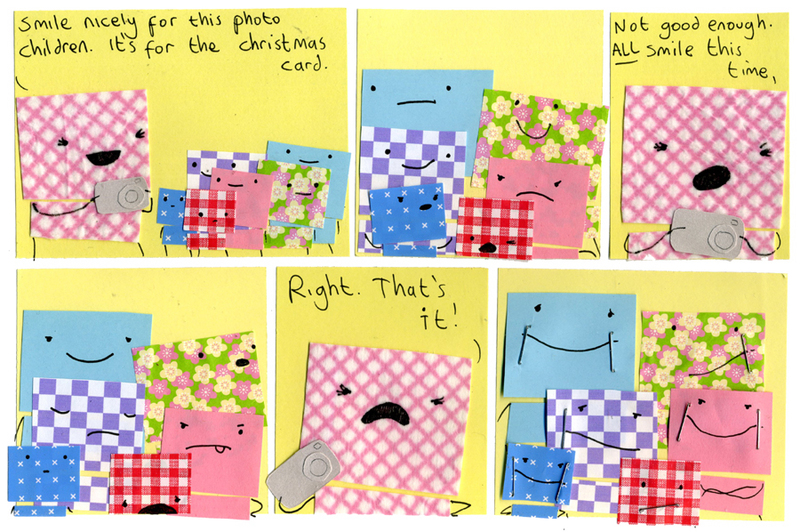 I think there should be a comic with the Christmas card in it. Oh no! Is this a strike of the staple attack? Everyone! Hide!!! Ouch. The red one still isn’t smiling in the last panel and none of them are smiling with their eyes. But as a person that works with large families a lot; that’s what you get for having so many children.